HyTech's designs are truly ground breaking with innovative ideas. We incorporate stepped primary pipes with anti-reversion chambers, plus our own special tri-y nozzle collectors. With the right combination of pipe length and diameter and the proper pairing of pipes in the collector, we have created a superior design that is equaled by no one. HyTech has proven that it can produce the very best. We have now used this technology from our racing designs to develop new versions for the Honda and Import street market. 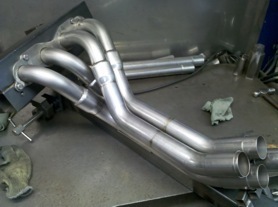 All of our exhaust systems are hand crafted out of aircraft quality stainless steel, they are tig welding for maximum strength and appearance. Not only do they out perform all others, they are the most esthetically appealing to the eye. HyTech also stands behind its product. 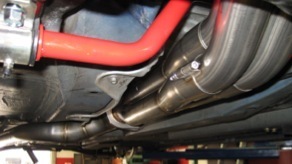 If you are not satisfied that the exhaust does not perform like we say it will, then we will offer you a full refund. No other header manufacturer will do that. It is all about acceleration or "Transient Response" as we call it. Which is how fast a particular engine will transient from its lowest rpm to its highest. And the exhaust has a major effect on how that happens. When the exhaust is designed right it will greatly influence how quick a motor will accelerate.